Every Saturday between April and Christmas I sell my work at a Farmerâ€™s Market in Charleston, South Carolina. 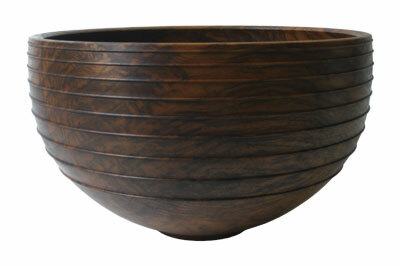 Primarily, I make utilitarian bowls, ornaments and jewellery. I strive for both a high level of craftsmanship and an approachable body of work that most people can bring into their homes. I have found that distinctive design elements with simple, classic forms provide a balance between the utilitarian object and the evidence of the artistâ€™s hand at work. I worked in glassblowing before woodturning, and this has strongly influenced my aesthetic. Glassblowing being an additive process, it is fairly simple to add a bead â€“ or a wrap as it would be called - around the outside of a form. This is the look that I aimed to achieve â€“ an uninterrupted form with beads that sat proud of the surface. The eye expects these beads to be made of another material, but due to the subtractive nature of woodturning, they are not. I achieve this piece by first creating a pleasant curve around the outside of the bowl with a push cut. Next, I use a second push cut from the bottom of the bowl to the bottom of the first bead. My bowl gouge has straight wings swept back at 40°, allowing me to push into a crisp corner. I use the same gouge to define the bottom edge of each bead, and then the vortex tool to roll the beads backwards on the side of the bowl. I use a negative-rake scraper to remove the material in between the beads that I cannot remove with the gouge.